When my son was a baby, I’d make his purees from fresh, whole, seasonal produce, creating new and different flavor combinations. While you can do this with some things you might already have in your kitchen, you can get fantastic equipment — like the Baby Bullet — that will make the process easier and even more fun. Here are seven new, delicious combinations for the fall and winter months. Your baby will love them! These purees can be refrigerated for up to two days and frozen for one to three months. Storing puree is super easy to do with the Baby Bullet because the storage jars are equipped with date-dials. It makes it so practical to make large batches of purees ahead of time. And as a super busy mom, the more I can do ahead, the better! 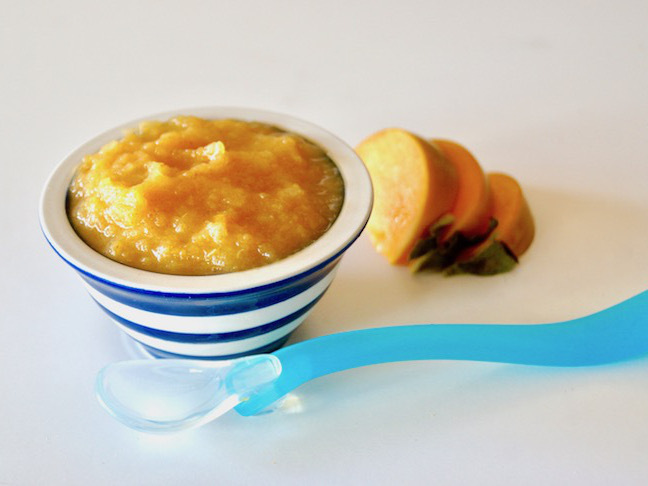 I’ve never met a baby that doesn’t love applesauce, and this applesauce is even yummier (and more nutritious) when combined with the squash. 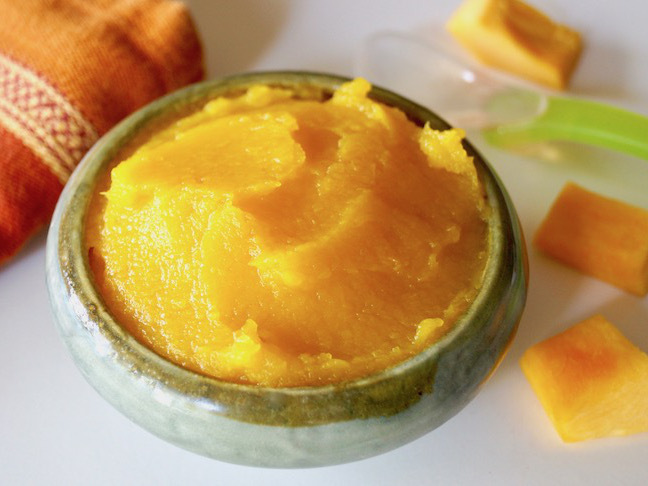 Nutrient-filled butternut squash and apple make for the perfect blend of creamy and sweet. Place the prepared butternut squash into the basket of a steamer pot with a few inches of boiling water. Over low-medium heat, cover and steam until almost tender, about 6 minutes. Then add the cut apples to the steamer basket and steam along with the squash for another 4 minutes. 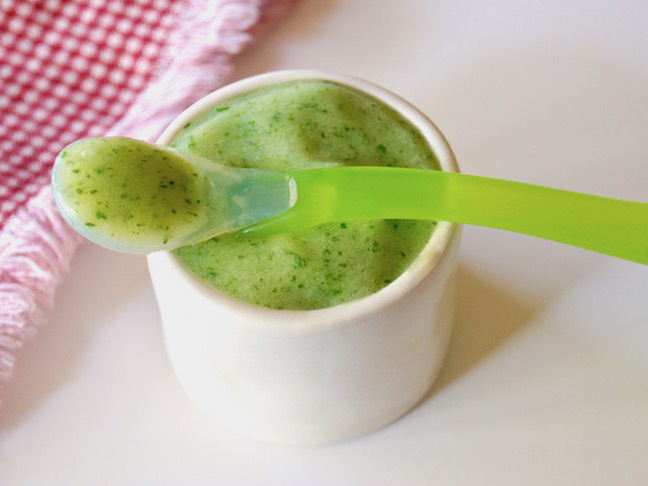 Puree with the water in a food processor or Baby Bullet. Once cool, serve or store. Pumpkin — that quintessential, tasty fall squash — is a great source of Vitamin E and C. A touch of banana gives it a creamy texture and brings out its sweetness. 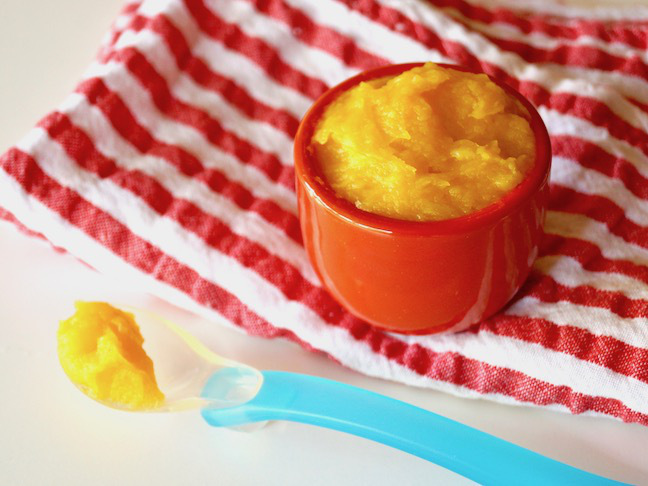 Your baby will love the puree’s bright orange color! Kale is chock full of many nutrients, including vitamin K, vitamin C, and vitamin A, making this puree a winner for everyone. Introducing leafy greens early is a smart way to help your baby develop a taste for them. Adding kale to the rich and creamy potato is a delicious way to do this.Kale is chock full of many nutrients, including vitamin K, vitamin C, and vitamin A, making this puree a winner for everyone. Introducing leafy greens early is a smart way to help your baby develop a taste for them. Adding kale to the rich and creamy potato is a delicious way to do this. Place the prepared potato into the basket of a steamer pot with a few inches of boiling water. Over low-medium heat, cover and steam until almost tender, about 8 minutes. Then add the kale to the steamer basket with the potatoes and steam until the kale is wilted and very soft, about another 2 to 3 minutes. Puree together with the water in a food processor or in a Baby Bullet. Once cool, serve or store. Kabocha squash is one of the jewels of the fall season. It has just the right amount of natural sweetness to blend well with parsnips which on their own can be somewhat bitter. Parsnips are high in fiber and potassium — and your baby will just love them served this way. Kabocha squash is one of the jewels of the fall season. It has just the right amount of natural sweetness to blend well with parsnips which on their own can be somewhat bitter. Parsnips are high in fiber and potassium — and your baby will just love them served this way. Place the prepared parsnips into the basket of a steamer pot with a few inches of boiling water. Over low-medium heat, cover and steam until they’re halfway tender, about 4 minutes. Then add the Kabocha to the steamer basket with the parsnips and steam until everything is soft, about another 6 minutes. Puree together with the water in a food processor or in a Baby Bullet. Once cool, serve or store. 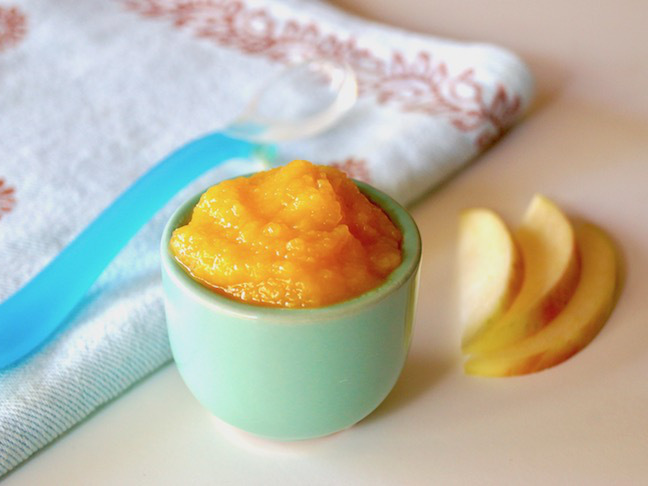 This puree has all the delicious flavors of carrot cake. Hydrating the golden raisins in hot water makes them soft enough to blend into the carrots smoothly. Imagine all that natural sweetness with a touch of spice. 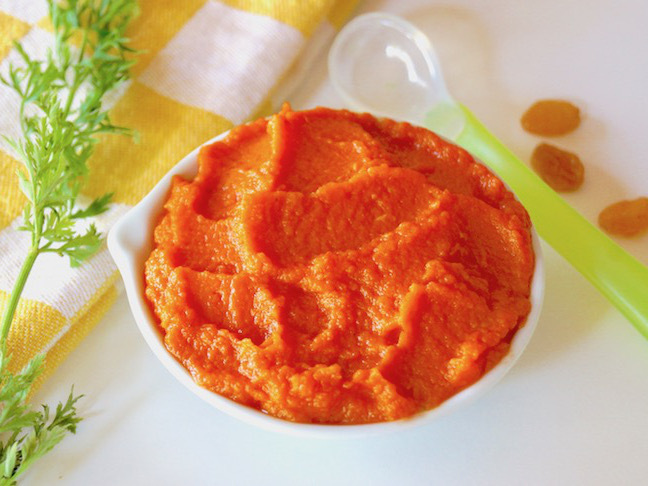 Baby will love it, and you might want to sneak a bite, too.This puree has all the delicious flavors of carrot cake. Hydrating the golden raisins in hot water makes them soft enough to blend into the carrots smoothly. Imagine all that natural sweetness with a touch of spice. 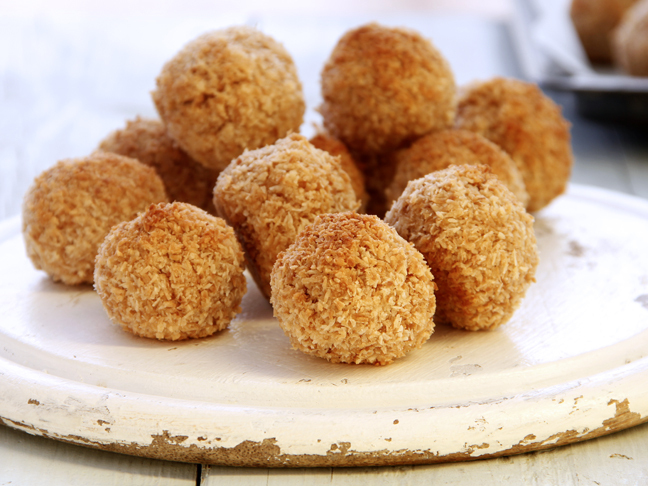 Baby will love it, and you might want to sneak a bite, too. Put the raisins in a small heat resistant bowl. Bring the water to a boil, then pour it over the raisins. Let sit for at least 20 minutes. Place the prepared carrots into the basket of a steamer pot with a few inches of boiling water. Over low-medium heat, cover and steam until soft, about 15 minutes. Put the carrots, raisins (with soaking water), and the cinnamon into a food processor or a Baby Bullet and puree. Once cool, serve or store. Place the persimmons into the basket of a steamer pot with a few inches of boiling water. Over low-medium heat, cover and steam until very soft, about 15 minutes. Puree with the pear in a food processor or in a Baby Bullet. Once cool, serve or store. Turnips are an unexpected (but yummy) root vegetable to use in baby foods. They’re rich in potassium and have a subtly sweet flavor. 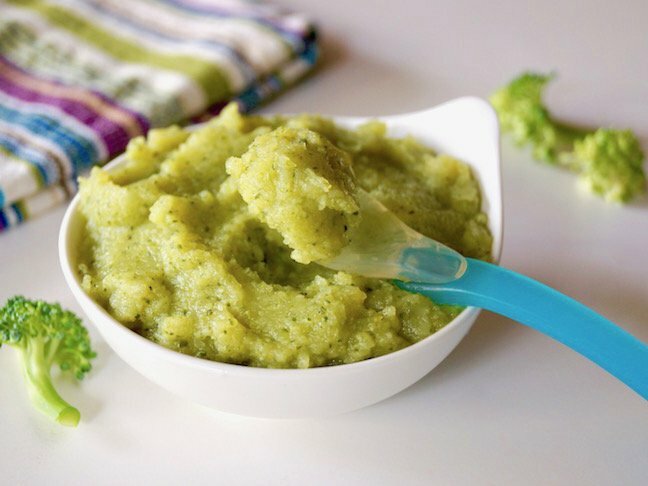 When pureed, turnips have a smooth and creamy texture; broccoli makes a perfect pairing. medium heat, cover and steam until soft, about 15 minutes. Add the broccoli to the basket and steam until everything is very soft, about another 10 minutes. Puree in a food processor or in a Baby Bullet. Once cool, serve or store.